Module security is similar to working with permissions in Security Roles. Click the Security icon to the right of the module to make module security adjustments. This is especially valuable when applying the same module to the same page in order for the module to work one way for a defined set of users and yet another way for a different set of users. In this case, you can add the same module but change the module settings for each application. Then you want to set security for the different modules. 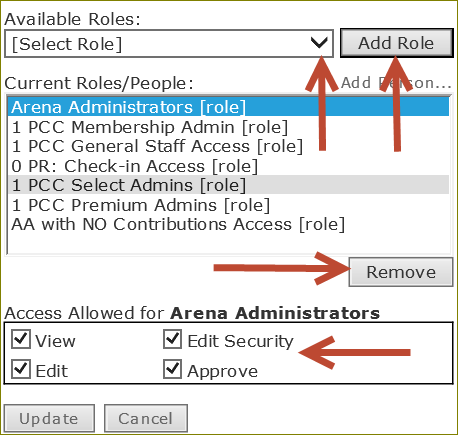 As you customize Arena for your organization, in cases where you apply the same module to the same page, you want to be sure the same security role(s) are not applied to both module instances to avoid both modules displaying for the user(s). 1. Select the Security Key for the module you want to change security permission. 2. Select the security roles from the Available Roles drop-down list you want to add or select the security role for the Current Roles/People window you want to remove from this module. You can optionally add individual users by selecting the Add Person link. 3. Click the Add Role button to add the selected security role or the Remove button to remove the security role. 4. Make desired security permission selections in the Access Allowed for section.